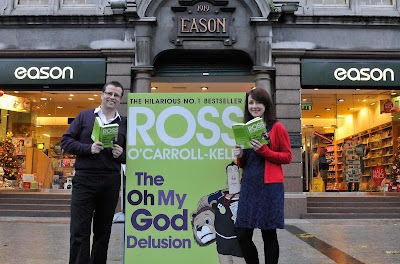 Wednesday 21st December: Dublin 4’s best-loved resident Ross O’ Carroll-Kelly has certainly captured the heart of the nation as ‘The Oh My God Delusion’ from the series written by author Paul Howard has been crowned Ireland’s Favourite Book. As part of their 125th anniversary celebrations, Eason, Ireland’s leading retailer of book stationery, magazines and much more launched a search to find the nation’s favourite read as voted by the people of Ireland. For weeks, thousands have been casting their vote via Eason’s new look website, www.easons.com, from a list of 125 top titles but it was Ross O’Carroll Kelly’s ‘The Oh My God Delusion’ that came out on top, competing with classics as such James Joyce ‘Ulysses’, Oscar Wilde’s ‘Picture of Dorian Gray’ and childhood favourites such as Roald Dahl’s ‘BFG’. Commenting on his prestigious win on Newstalk’s Tom Dunne show, Paul Howard, author of the Ross O’Carroll Kelly series said, “I am thrilled that ‘The Oh My God Delusion’ has topped Eason’s poll to find the nation’s favourite book. I’ve been writing Ross O’Carroll-Kelly books for 13 years now and it’s very gratifying that readers still find the books relevant and funny. ‘The Oh My God Delusion’ is the tenth novel in the series, which I began writing as a way of poking fun at middle class rugby culture but which became a means of satirising Celtic Tiger Ireland. “This book was the first recession era book, tracing the descent of Ross and his circle of friends from affluence to penury. It’s great that readers have stuck with the story and are still laughing. And God knows we need a laugh in these grim times! I’d like to say a very special thanks to Eason, who have huge supporters of Ross since the very first book, and everyone who voted”, continued Paul.